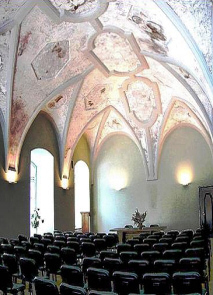 Atmospheric guest house in Vilnius set in a renovated Monastery. Domus Maria guest house in Vilnius is appealing to John and me as it offers a unique atmosphere for your stay. Set in the renovated 15th century Carmelite monastery the guest house retains a lot of character and spirit of the past. The guest house also stands out for its pretty location as it is situated alongside the Gates of Dawn and next to the spectacular baroque Church of St. Theresa. The main Old Town Street is just a minute away with restaurants and cafes, amber shops and other attractions. Domus Maria is a bigger hotel than others we featured above. Yet tucked away into the cosy courtyard, it assures a peaceful and relaxing stay. 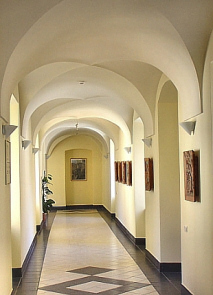 The former monastery cells were thoughtfully converted into appealing rooms made to retain its original layout with large windows and high ceilings. Some of the rooms are not very spacious, but they are bright and comfortable. The pleasant rooms are decorated in minimalist style and furnished with light-wood furniture. All of the rooms come complete with the basic conveniences including a telephone, TV, Internet connection and a bathroom (with bath or shower). The more upmarket rooms have minibars and baths.Domus Maria also offers family apartments with two separate rooms. 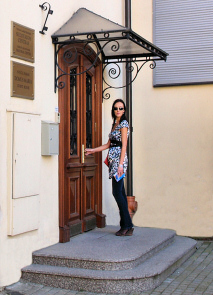 This guest house in Vilnius would be a good option for disabled travellers as some rooms have specially equipped bathrooms, adapted for disabled guests. 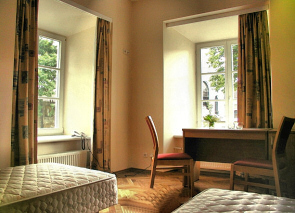 The guest house services include food catering, guarded parking, safe deposit box and luggage store room, transportation, tours around Vilnius and country. Hair-dryer, iron and ironing board are provided upon your request. It’s worth seeing the hotel’s largest conference hall (photo above), which contains some authentic 18th century frescoes. Unfortunately, this hotel is not included in our choice booking company, booking.com that offers discounts, therefore, if you wish to book this hotel see the details below. Places closest to you: The Gates of Dawn, Medininkai restaurant , Absinthefairies bar, Ibish Lounge bar, The Town Hall.